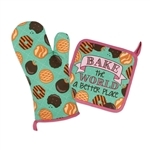 “Bake the World A Better Place” one batch at a time with this adorable duo! 8" x 8" pot holder and 13" x 7" oven mitt have matching multi-color Girl Scout cookie imprint against mint green background. Bright pink trim. Each has loop for hanging. Cotton. Oven mitt has polyester/cotton quilted lining. Imported.